Is a native of the county, and began life as a farmer, and still owns a farm near London. Located in West Jefferson in 1891, and began the lumber and grain business. The firm being Gallagher and Murray. 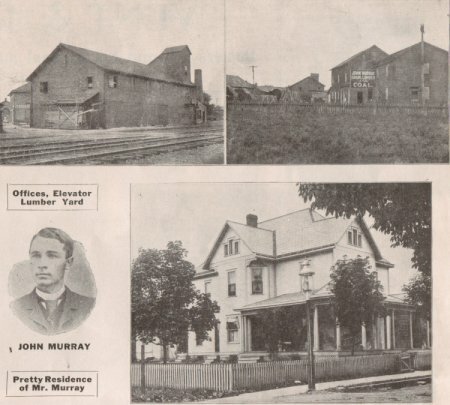 In 1895, a lumber yard was established in London, but in 1901, the firm was dissolved, Mr. Gallagher taking the London end, and Mr. Murray the West Jefferson. The businss has expanded year by year, and Mr. Murray has a wide circle of customers. He is prominent in all walks of life, taking an interest in town and county affairs. Has served as township treasurer, township clerk, corporation treasurer two terms, member of the school board two terms, councilman two terms, and in other positions of trust and honor. He is married and with his wife and four children, resides in a handsome house in West Jefferson. Mr. Murray has always been a Democrat, and believes in teh good old democracy of the people. He is a Forester, and a warden in St. Simon & Jude's church. As citizen, business man and friend, his popularity is wide.